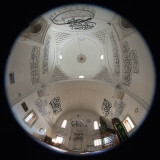 The mosque is a fine specimen of the older kind, with separate rooms to either side of the main hall. In 2018 the Imam explained that these rooms formerly were used to housed travellers. And it sits beautifully at the riverside.